James Denselow's latest article — "The axis of pragmatism," Syria's emergence as a confident regional power has been paralleled by a shift in the foreign policy of its former enemies — is in the Guardian and covers the rebirth of Syria's regional position. July 28 (Bloomberg) — Syria is serious about seeking peace with Israel in exchange for the return of the Golan Heights, Syria's ambassador to the U.S., Imad Moustapha, said in an interview with the nonpartisan Peace Now organization. “This is the state of Syria, telling the state of Israel, that we desire to end the state of war between us, to conclude peace between the two states and to recognize each other and live as peaceful neighbors within a normalized context,'' Moustapha said in a recording of the interview provided by Peace Now Director General Yariv Oppenheimer. Tel Aviv-based Peace Now promotes peace between Israel and its Arab neighbors…. “If Israel really wants peace with Syria, with Lebanon, if they want normalized relations and security on the northern borders, they cannot have this while they continue occupying our Golan,'' Moustapha said. Olmert, 62, has never said outright that he would contemplate a land-for-peace deal with Syria. He has said that each side recognizes the other's demands and understands they must be met before an accord can be reached. Public opinion polls show that two-thirds of the public opposes returning the Golan to Syria. George K. suggests this WSJ book review, which he says is "extremely entertaining helps us to understand today's Middle-Eastern. At one point, in the middle of his presentation, the writer is highlighting the following: "In the war between Christendom and Islam: long sieges, ferocious battles and a Venetian commander flayed alive." In all European history, there is no more stirring story than that of the long struggle between Christianity and Islam for mastery of the Mediterranean. The story begins, essentially, in the early hours of May 29, 1453 — it was a Tuesday — when the army of the Ottoman Sultan Mehmet II the Conqueror burst through the walls of Constantinople and put an end, after 1,123 years and a siege lasting 55 days, to the Byzantine Empire. The story concludes a little more than two centuries later with Islam's final triumph, on Sept. 26, 1669 — a Sunday — when, after 465 years as a Venetian colony, the island of Crete saw the banner of St. Mark lowered for the last time. 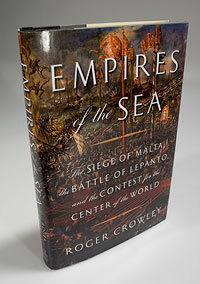 In "Empires of the Sea," Roger Crowley has taken as his subject the six decades from 1520 to 1580, the middle act — and by far the most important — of this tremendous drama. The act contains five main scenes. The first is set on the island of Rhodes in 1522, where for six months the Knights Hospitallers of St. John heroically resist the army of Mehmet's great-grandson, Süleyman the Magnificent, before their inevitable surrender…. RIYADH (Reuters) – A Turkish soap opera that flopped when first broadcast in its native Turkey three years ago has taken the Arab world by storm, provoking a flood of Gulf Arab tourists to Turkey that even includes royalty. "Noor" became an immediate hit when Saudi-owned MBC satellite television began airing it earlier this year, partly because of its unconventional usage of colloquial Arabic dubbing — and because its blond-haired, blue-eyed leading man had women swooning. Turkey is expecting the number of Saudi tourists this year to top 100,000, including King Abdullah's wife Hissa al-Shaalan, who has been the subject of YouTube videos showing her swanning through the markets and sweet-shops of Istanbul. "From 41,000 (tourists) last year to 100,000 this year — the same year this show became phenomenally successful," said Turkish diplomat Yasin Temizkayn. "It's more than just a coincidence." ….